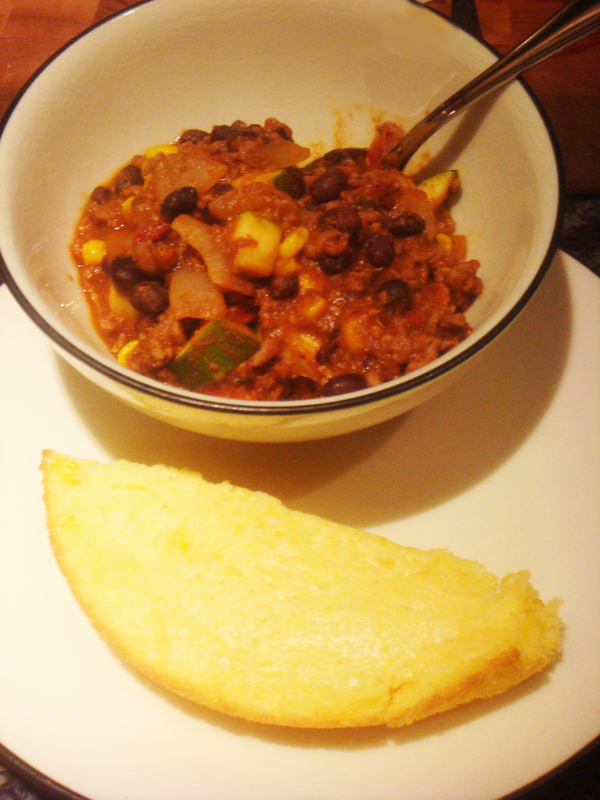 With winter in the air (on the days when it’s not 60 degrees at the end of November) and a pound of ground beef in the freezer, last night’s dinner was a clean out the fridge chili. Chili is great because it’s a hearty and comforting one-pot meal that is super versatile. I also love that it can be ready in 30 minutes but the longer it sits the better it tastes. All you need for a great chili is ground meat, vegetables, and some sort of tomato product. And really, you only sort of need the meat! You also need a little creativity and the confidence to know that most vegetables would be good in chili if you add the right spices. The rest is a story about seasoning and building flavors. I started this recipe the way I start most of them, with some olive oil, garlic, and a diced onion. 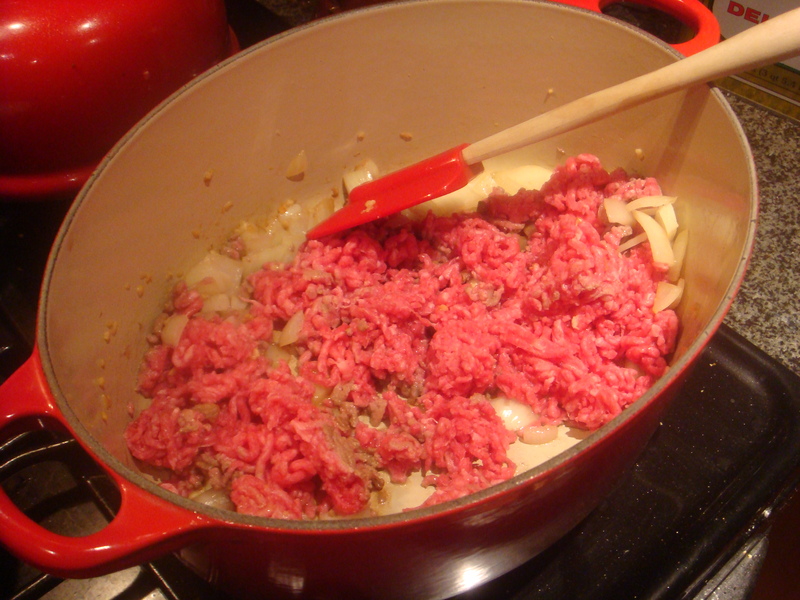 Once the onion becomes translucent, add in the ground beef and mix every 30 seconds or so so the beef cooks evenly without drying out. Now, if you don’t have all those ingredients that’s fine! Just try to add heat and smokiness using whatever you have in the spice cabinet. I think the most important are chili powder, salt, pepper, and cumin. One ingredient that I want to call out is adobo. It was listed earlier in the form of “chipotle in adobo” which is a newer secret ingredient that my coworker taught me. You can buy it in a can in the Latin food aisle (Goya makes one version). 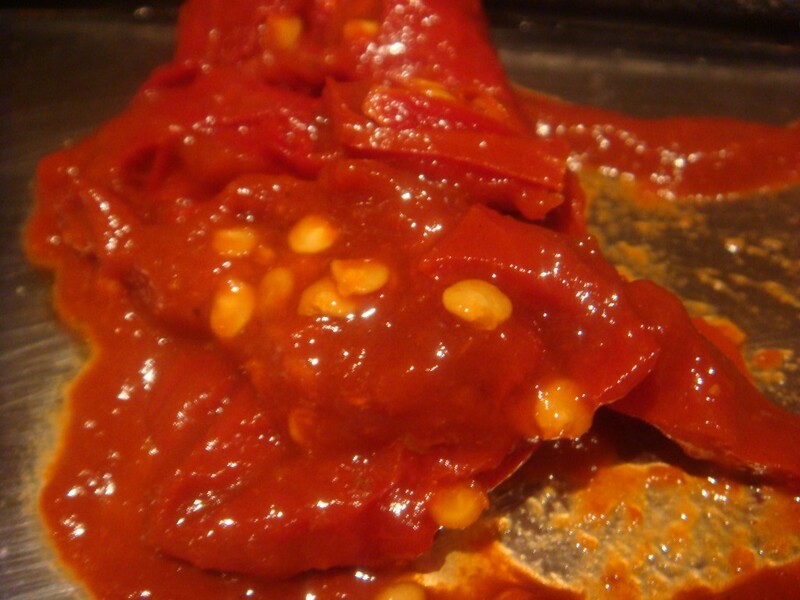 It adds a depth of flavor and heat that is wonderful and different. One thing to keep in mind is that the chipotle chilies vary in heat depending on the soil and a bunch of other factors, so taste the adobo sauce for its heat level and start with a little to make sure you don’t make your chili too spicy! For last night’s chili I used one pepper and 1 Tbsp of adobo and it was perfect for me, a little too spicy for normal people. Ok, so now you are well on your way to building a great flavor base! Once the meat is mostly cooked, add in the rest of the vegetables and the pasta sauce. 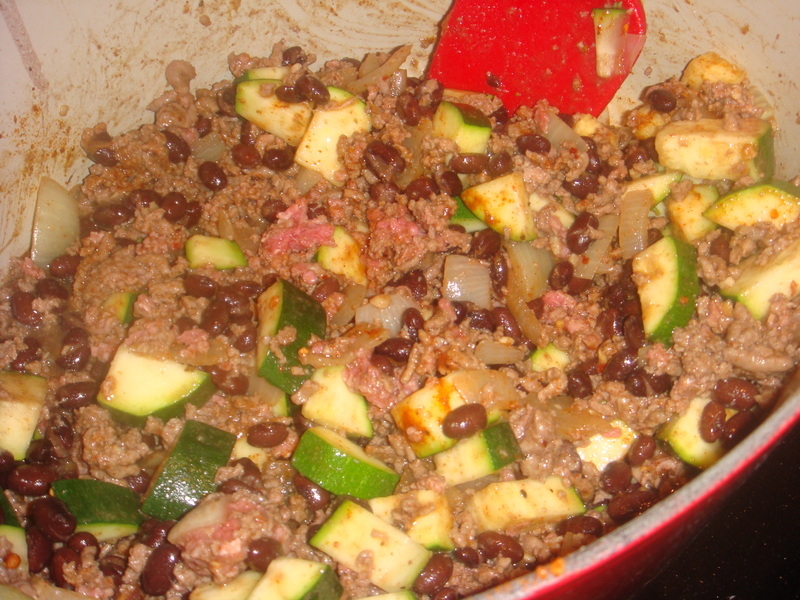 I would add the zucchini and black beans first since they are the heartiest and can stand up to being cooked the longest. The corn and tomatoes can wait until the flavor is where you want it to be. That’s really all there is to it. Once everything is cooked, reduce the heat to low, cover, and simmer for at least 10 minutes. This recipe made about 5 servings. I served corn bread on the side and some shredded mexican cheese on top. Sour cream, salsa, any other usual chili condiments would also work!